Memorial at Hillsborough Stadium to the 96 lives lost during the Hillsborough disaster of April 15, 1989. 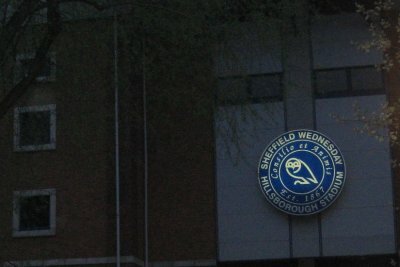 Hillsborough stadium, just outside of central Sheffield in the part of town called Hillsborough is home to football club Sheffield Wednesday. 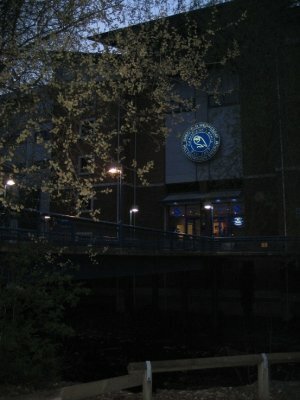 Sheffield Wednesday Football Club was established in 1892 to keep the local cricket club in shape during the off season. The cricket club was named for the day of the week on which they played, Wednesday. The name ended up transferring over to the FC club. 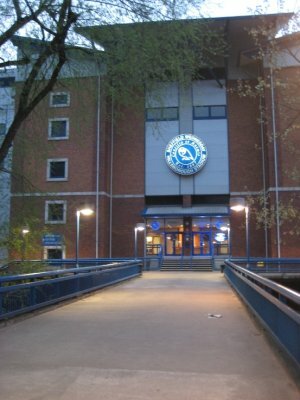 The club is also known as the Owls after a mascot given to them in the early 20th century. In 1899, the club moved to a football stadium just to the north of Hillsborough Park. Though the stands have received some renovations over the years, the Owls have played on the grounds in 1899. On April 15, 1989, the grounds was to play host to an FA-Cup semi-final between Liverpool and Nottingham Forest. As was standard practice at most important matches, fans were segregated to try and keep any trouble to a minimum. 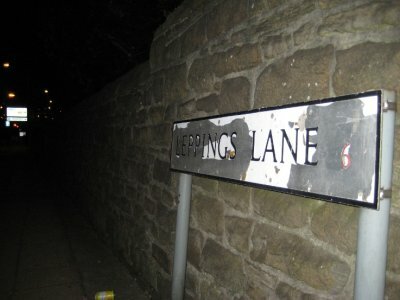 Nottingham Forest fans were assigned the Spion Kop End, with Liverpool fans being given the Leppings Lane side of the stadium, named after the street on which the entrance to the stand is. Kick-off was scheduled for 3:00 pm, with fans told to show up 30 minutes before the match. However, fans were late, many due to unscheduled road works on the M62 that runs between Liverpool and Sheffield. Many fans were still outside the stadium as kick-off time was drawing near. Due to the fears soccer hooliganism, at the time fans were enclosed by high steel fences to keep them off the pitch. As more and more Liverpool fans tried to stream into the stadium, those at the front started to be crushed against the fence, with no escape routes. Generally, police and stewards would have stood at the entrance to the tunnel directing fans away from the full central pens and to the side pens. This did not happen during this match. With kick-off near, the police outside of the stadium were unaware of the crush at the front of the stands. Fearing a crush of fans or violence outside the stadium, they opened a large gate that was to be used as an exit, causing a rush of fans into the stadium. When the match started at 3:00 pm, already fans were being killed in the crush. Fans at the back of the mass were unaware of the problems up front, and with their focus on the match, continued to surge forward. Some Liverpool fans were lucky enough to climb over the fences, alerting the police to the problem. The police stopped the match at 3:06 pm. Clive Betts, MP for Sheffield was at the match, and in April 14th edition of the Sheffield Star is quoted as saying, "The game kicked off and there was what looked like crowd problems. Then people starting climbing over the fences to get out. There were more and more people trying to get out. The referee stopped the game and the players walked off. It took a long time for the scale of disaster to become apparent, for people to realise that people were dead on the pitch, that there was resuscitation going on. People were absolutely stunned. Things like this don't happen at football matches." The human crush ended up killing 96 Liverpool fans and injuring over 700 people. The force of the fans must have been enormous. Richard Caborn, MP for Sheffield Central, was also at the match. "I was on the terrace and saw one of the bars which was supposed to keep crowds from surging forward. It was bent, and I was told it would have taken something like a quarter of a tonne to have done that." The deaths and injuries at the match brought about many changes in football stadium in the UK. Standing room and general admission with penned-in fans were replaced by all-seating stadiums. 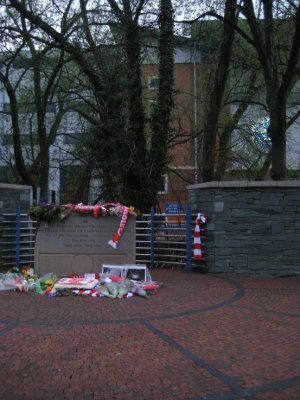 In 1999, on the tenth anniversary of the disaster, a memorial was unveiled at Hillsborough in the memory of the fans who died there. 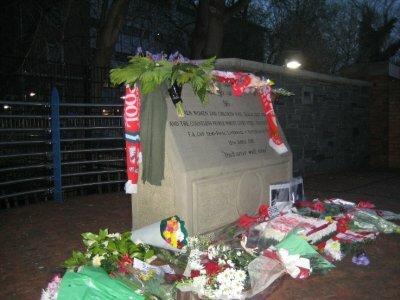 Today, the day before the 20th, some of those who lost people, as well as other Liverpool fans affected by the tragedy, stopped by to drop off flowers, pictures and scarves in honour of the dead, before heading off to see Liverpool play Chelsea in an EUFA Champions league Quarter final game. The anniversary brings about mixed feelings here in Sheffield, as people are obviously horrified at the loss of life and the injuries, but also sensitive about the South Yorkshire police taking a lot of the blame for the tragedy. Many from Liverpool are still angry that those in charge of security that day were not charged with any crimes. However, the people of Sheffield will mark the disaster quietly tomorrow, with two minutes of silence from 3:06 to 3:08 pm in the city centre, at Meadowhall (the regions largest shopping mall) and of course at Hillsborough stadium and along Leppings Lane.